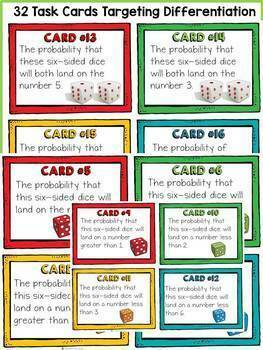 This pack of 32 task cards will help reinforce teaching and learning of probability using the numbers on a six-sided standard dice. 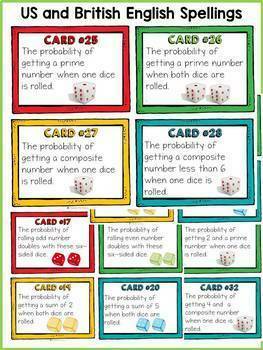 The question types on the task cards are based on the probability of events occurring if one or two dice were rolled. The cards are varied in order to cater to differentiation. Separate file with British English spellings included. 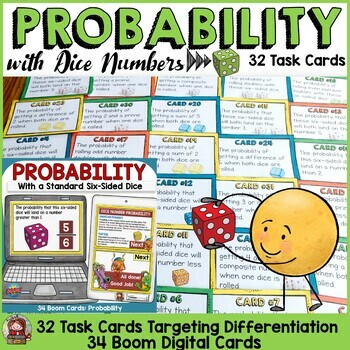 Reference/Cheat Sheet (targeting differentiation): Have students fill up the table to list all the possible outcomes with two six-sided dice prior to them having attempt the task cards. 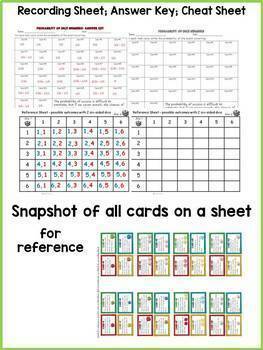 Reference Sheet (color snapshot of all task cards on a single sheet): Have students glue in their notebooks for reference.